Astronomers at the Center for Exoplanets and Habitable Worlds have measured the masses of ten small exoplanets, a big boost to the number of small exoplanets with measured masses. All ten of these planets were discovered by NASA’s Kepler mission which was designed to find transiting exoplanets. Each of these planets transits (i.e., periodically passes in front of) its host star, once each time it completes an orbit around its host star. The change in brightness in their host star when the planets pass between us and the star allows astronomers to measure the size of the planet (relative to its host star). Measuring the mass of small planets is crucial to understanding the density of the planets and determining if these distant worlds are primarily rocky (like the Earth) or more similar to Neptune (a small core of rock and/or ice surrounded by a large atmosphere). For some transiting planets, follow-up observations using ground-based observatories with high-resolution spectrographs can measure the planet’s mass. Unfortunately, the Doppler method is impractical for many of the planets found by Kepler due to the properties of the planet’s host star (e.g., too faint, too hot, or spinning to rapidly). In a recent study led Dr. Daniel Jontof-Hutter and Prof. Eric Ford of the Pennylvania State University, astronomers measured the mass of these planets. By performing a more detailed analysis of Kepler data, the team was able to detect the planets accelerating or slowing down due to the gravity of their neighboring planets, causing the time of the transit to vary by a detectable amount. Jontof-Hutter and Ford’s detailed analysis of these “transit timing variations” allowed them to characterize the masses of the small planets. The study also advanced the state-of-the-art in statistical methodology to establishing the robustness of planet mass measurements and identified several more planets for which present data is unable to provide precise and robust masses. 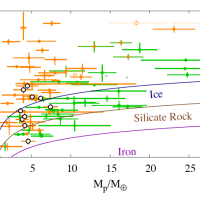 The 10 well-characterized planets from this study are remarkable in that they have a small range in mass, from 3-8 times that of Earth, but show a huge variety in their densities. Dr. Jontof-Hutter attributes this to the different amounts of starlight they receive. The four densest planets in their study all receive well over 100 times as much energy from their stars as the Earth receives from the sun, and may have had their atmospheres boiled away from the high temperatures. Like other presumably rocky exoplanets currently know, these planets are much hotter than the Earth. The other six planets whose masses were measured in this study are a bit cooler and show a range of densities that correspond to planets made from a mixture of rock and water or hydrogen gas to planets made of mostly hydrogen. The results are described in an article titled, “Secure TTV Mass Measurements: 10 Kepler Exoplanets between 3 and 8 Earth-masses with Diverse Densities and Incident Fluxes” which has been accepted for publication in the Astrophysical Journal. Jontof-Hutter and Ford’s research was supported by the Center for Exoplanets & Habitable Worlds, and made use of data from NASA’s Kepler mission. The research team also included Dr. Jason Rowe (Université de Montréal), Dr. Jack J. Lissauer (NASA Ames), Prof. Daniel Fabrycky (University of Chicago), Dr. Christa Van Laerhoven (Canadian Institute for Theoretical Astrophysics), Prof. Eric Agol (University of Washington), Dr. Katherine Deck (Caltech), Dr. Tomer Holczer (Tel Aviv University), and Prof. Tsevi Mazeh (Tel Aviv University).